A company using tracked drag-lines in quarrying found that drivers were being exposed to A-weighted noise levels of 96 to 100 dB. The particular problem was that the main drive engine, in this case a 220 hp diesel, was located in the same all steel 'box', separated from the driver's cab only by a sheet steel bulkhead containing a door. Engine noise was being transmitted through the cab bulkheads and floor panelling. Mechanical vibration from the engine and drag-line drives also travelled easily through the steel structure to add to noise levels in the driver's compartment. The first stage in the noise reduction programme was to reduce the mechanical vibration. This was achieved by applying pads of a proprietary damping compound to all available sheet steel surfaces in the engine compartment and driver's cab. Noise transmissions through the cab bulkhead and floor were then reduced by applying a lead/fibreglass laminate to both faces of the bulkhead and to the underside of the cab floor. Finally, reverberation in the driver's cab was reduced by applying PVC-faced acoustic foam to the roof panels and other available internal surfaces. A noise reduction of up to 10 dB. 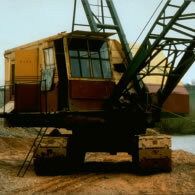 The treatment can be applied to similar site plant such as shovels, bulldozers and scrapers.